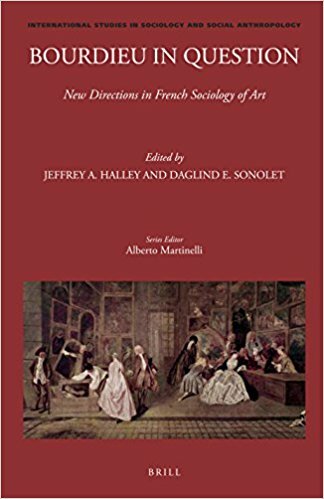 In Bourdieu in Question : New Directions in French Sociology of Art, Jeffrey A. Halley and Daglind E. Sonolet offer to English-speaking audiences an account of the very lively Francophone debates over Pierre Bourdieu’s work in the domain of the arts and culture, and present other directions and perspectives taken by major French researchers who extend or differ from his point of view, and who were marginalized by the Bourdieusian moment. Three generations of research are presented : contemporaries of Bourdieu, the next generation, and recent research. Themes include the art market and value, cultural politics, the reception of artworks, theory and the concept of the artwork, autonomy in art, ethnography and culture, and the critique of Bourdieu on literature. Contributors are : Howard S. Becker, Martine Burgos, Marie Buscatto, Jean-Louis Fabiani, Laurent Fleury, Florent Gaudez, Jeffrey A. Halley, Nathalie Heinich, Yvon Lamy, Jacques Leenhardt, Cécile Léonardi, Clara Lévy, Pierre-Michel Menger, Raymonde Moulin, Jean-Claude Passeron, Emmanuel Pedler, Bruno Péquignot, Alain Quemin, Cherry Schrecker, Daglind E. Sonolet.